Investing in equity precious metals funds should be part of every investor’s strategy. Precious Metals funds have been the only bright spot during the market downturn period. While financial crisis has passed, no one can predict when another one will occur. Rule of thumb is to have 5-10% asset in these commodity funds for asset diversification. 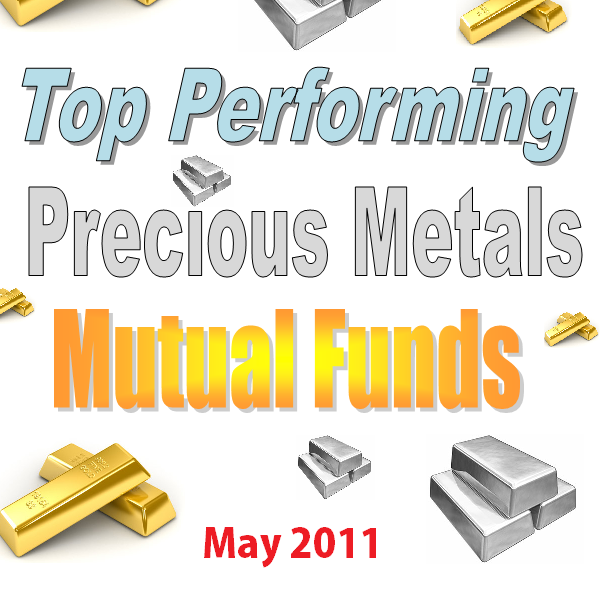 The following is the top performing equity precious metals mutual funds up to May 2011. Most of these funds have returned amazing performance return for the past decade. For YTD performance, these equity precious metals funds have been lagging the overall market performance. Well known for its index funds, Vanguard also offers this equity precious metal funds with one of the lowest fee. This Vanguard Precious Metals and Mining Investor fund is the top performing fund in Equity Precious Metals category with -2.37% YTD return. This Vanguard Precious Metals and Mining Investor fund seeks long-term capital appreciation. The major net assets are invested in the stocks of foreign and U.S. companies mainly related with the mining, exploration, distribution or processing, of gold and other precious metals. This non-diversified fund may choose to invest directly in gold, silver or other precious-metals bullion and coins with maximum of 20% of the assets. The fund lead manager is Graham French since June 1996. The fund inception date was May 1984. This Vanguard fund has the largest amount of total net assets with $5, 8 billion. As part of no load fund, this Vanguard fund doesn’t have any front end sales load and deferred sales load. 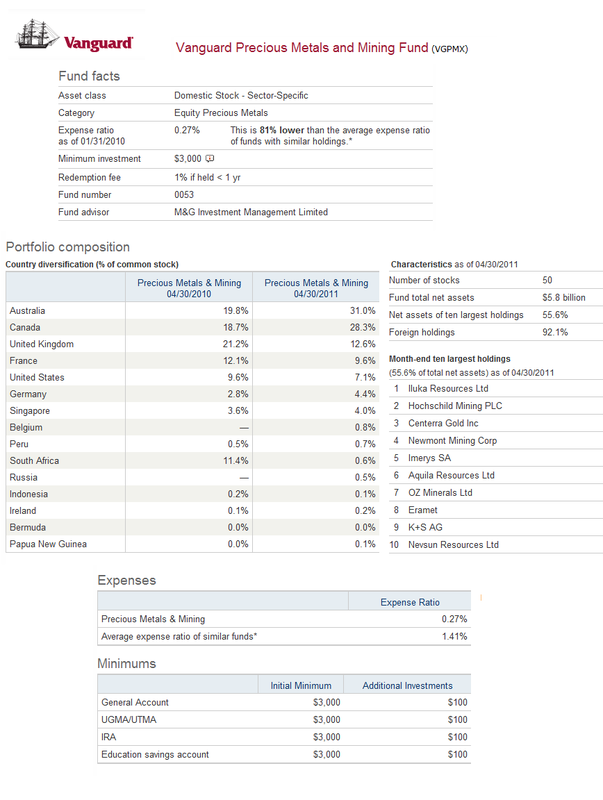 The fund’s expense ratio is 0.27% per year, the lowest among all funds described here. 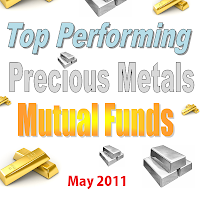 This Vanguard Precious Metals and Mining fund also has 2 stars rating from Morningstar. As of April 2011, VGPMX has 92.1% foreign holdings. The month-end ten largest holdings represent 55.6% of total net assets. They are Ilkua Resources Ltd, Hochschild Mining PLC, Centerra Gold Inc, Newmont Mining Corp, Imerys SA, Aquila Resources Ltd, OZ Minerals Ltd, Eramet, K+S AG and Nevsun Resources Ltd.
As the highest rated fund by Morningstar (5 star rating), Tocqueville Gold fund objective is looking for long-term capital appreciation. This Tocqueville fund will invest its assets in gold and securities of companies located throughout the world. The companies invested are engaged in gold mining or processing and may be in both developed and emerging markets. 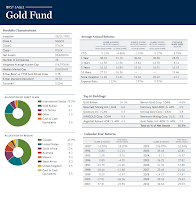 Similar to Vanguard fund, a maximum of 20% of the assets are invested directly in gold bullion and other precious metals. The fund has been managed by John C. Hathaway since its inception in June 1998. 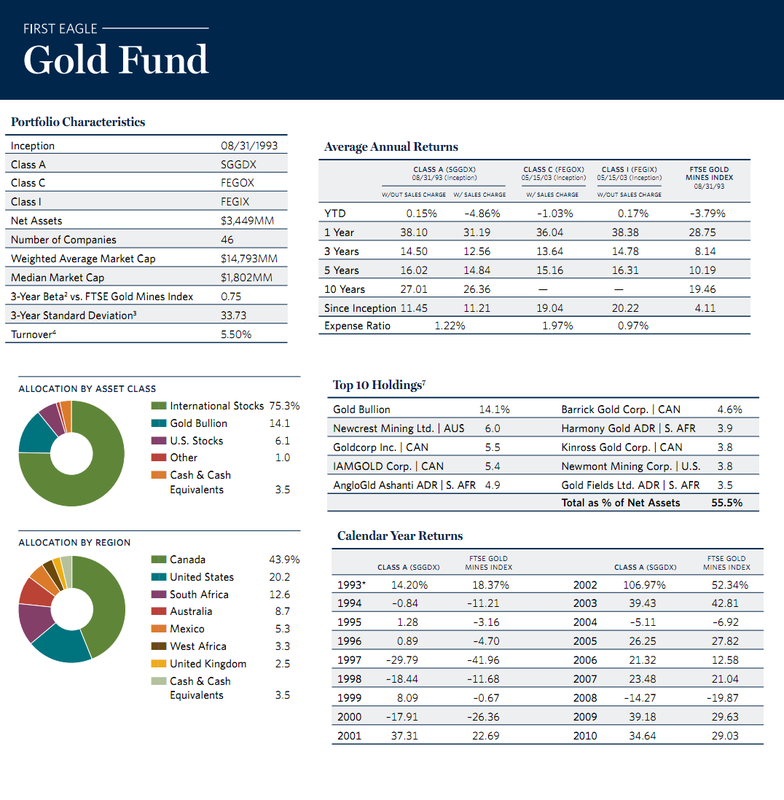 The expense ratio of this Tocqueville Gold fund is 1.34% per year and is slightly lower than 1.41% category average. This fund also charges management fee of 0.25%. There is no front-end sales load fee. The minimum balance to invest in brokerage account of this fund is $1,000 and IRA account is $250 with $100 of minimum subsequent investment. TGLDX can be purchased from 62 brokerages, such as T Rowe Price, JP Morgan, Schwab Institutional, E Trade Financial, Schwab Retail, Vanguard NTF, Royal Alliance, Raymond James, etc. The fund best 1 year return occurred in 2009 with 86.60% return. The worst performance is -34.94% in 2008. 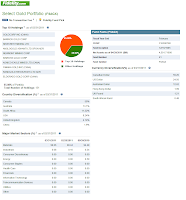 As of March 2011, this fund has 79 holdings and the top ten holdings are Goldcorp Inc (5.32%), Ivanhoe Mines Ltd (5.26%), Physical Gold (5.25%), Silver Wheaton Corp (4.41%), Osisko Mining Corp (4.27%), Gold Resource Corp (3.78%), International Tower Hill (3.06%), Newmont Mining Corp (2.99%), IAMGOLD Corp (2.81%) and Randgold Resources Ltd (2.69%). The portfolio statistics of TGLDX are 86.65% in equities, 7.13% in cash equivalents and fixed income, 5.52% in physical gold and 0.70% in Investment Company. The investment in First Eagle Gold is meant to provide capital growth in long-term period. This fund provides investors the chance to contribute in the investment characteristics of gold for a portion of their whole investment portfolio. The major assets are invested in gold and or securities directly related to gold or of issuers mainly involved in the gold industry. The remaining 20% of the assets are invested in equity and in debt securities unrelated to gold or the gold industry (in a limited context). Since February 2009, the fund manager is Rachel Benepe. Since it is a load fund, this Class A fund has 0.25% 12b1 fee and 5.00% front-end sales load fee. The annual expense ratio of this fund is 1.22%. The fund has returned 17.14% over the past three years and 25.83% over the past decade. This fund is another five star fund according to latest Morningstar rating. There are 91 brokerages in which this fund can be purchased, include Merrill Lynch, Edward Jones, JP Morgan, Schwab Retail, Royal Alliance, E Trade No Load Fee, etc. You can also invest in other classes of this First Eagle Gold fund, such as Class C (Ticker: FEGOX) and Institutional Class (Ticker: FEGIX). As of the first quarter of 2011, the fund top holdings are Gold Bullion, Newcrest Mining Ltd, Goldcorp Inc, IAMGOLD Corp, ANgloGld Ashanti ADR, Barrick Gold Corp, Harmony Gold ADR, Kinross Gold Corp, Newmont Mining Corp and Gold Fields Ltd ADR. These ten holdings represent 55.5% of the total net assets. The allocations by assets class are 75.3% in international stocks, 14.1% in gold bullion, 6.1% in U.S. Stocks, 1% in other and 3.5% in cash& cash equivalents. For investors that are choosing to invest in Invesco Gold & Precious Metals investment, their main objective is to seek for long-term growth of capital. IGDAX has invested 80% assets in securities of issuers engaged mainly in exploring for mining, dealing, processing, and investing in gold and other precious metals such as silver, diamonds, platinum and palladium; even though the main investment is in equity securities. This fund lead manager is Andrew Lees since May 2008. The fund inception date was March 2002. It has an annual expense ratio of 1.29%. This class fund has 5.50% front-end sales load fee and 0.25% management fee. If you are interested in this Invesco fund, you can invest in other fund classes include IGDCX (Class C), FGLDX (Investor Class) and IGDYX (Class Y). These classes may offer lower fee and slightly higher performance. To invest in this Invesco Gold & Precious Metals fund, you will need $1,000 minimum initial investment for brokerage account with $50 minimum subsequent investment. 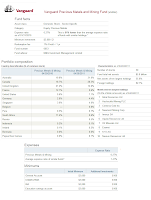 The fund YTD return is 4.47% with 14.09% of 5-year average return. This equity precious metals mutual fund has returned 26.50% over the past year, and 14.47% over the past 3 year. This fund also has an outstanding performance over the long term period. The fund returned 22.35% over the past decade. The best performance was achieved in 2009 with 55.53%. The top 10 holdings as of March 2011 are Silver Wheaton Corp (8.88%), Goldcorp Inc (5.51%), IAMGold Corp (5.11%), Barrick Gold Corp (4.76%), Yamana Gold Inc (4.40%), Detour Gold Corp (4.07%), Newcrest Mining Ltd (4.03%), Newmont Mining Corp (3.85%), Compania de Minas Buenaventura S.A. (3.44%) and Osisko Mining Corp (3.32%). The top industries are gold, precious metals & minerals, diversified metals & mining, investment companies ETF and coal & consumable fuels. This OCM Gold Investor fund has the objective of providing capital growth in long-term period. To achieve its goal, this fund invests at least 80% of the net assets plus borrowings for investment purposes in equity securities and common stocks. The securities are issued by domestic and foreign companies of any size engaged in all sectors of the gold mining industry. OCMGX prefers to invest in junior, intermediate or senior gold producers, gold mining exploration and development companies and gold mining royalty companies. OCMGX has distributed 0.05% dividend in November 2005 and 0.53% capital gain in December 2009. The expense ratio rate is 0.93% per year. The minimum initial investment to invest in the brokerage account of this fund is $1,000. There is a 12b1 fee of 0.81% and sales load fee of 4.50%. This fund has returned 21.86% over the past one year and 12.63% over the past five years. The best 1-year return was recorded in 2002 with 93.25% during its 11 positive return years. The worst 1-year return was in 1997 with -37.50%. OCMGX has 13.67% of 5-year average return and 1.87% of year-to-date return. The lead manager of this fund is Greg Orrell. He has managed this fund since its inception in February 1988. This fund can be bought from 32 brokerages include Td Ameritrade Inc, Scottrade Load, Fidelity Retail Funds Network, Common Wealth Universe, Raymond James, JP Morgan, E Trade NLF, etc. 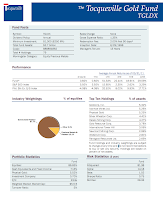 The fund has 12.0% of annual holdings turnover as of October 2010. As of March 2011, the top ten holdings of this fund are Goldcorp Inc, Randgold Resources Ltd, IAMGold Corporation, Kinross Gold Corporation, AngloGold Ashanti Limited, Agnico-Eagle Mines, Silver Wheaton Corporation, Centera Gold Inc, Eldorado Gold Corp and SPDR Gold Shares. These top ten companies make up to 59.78% of its portfolio. 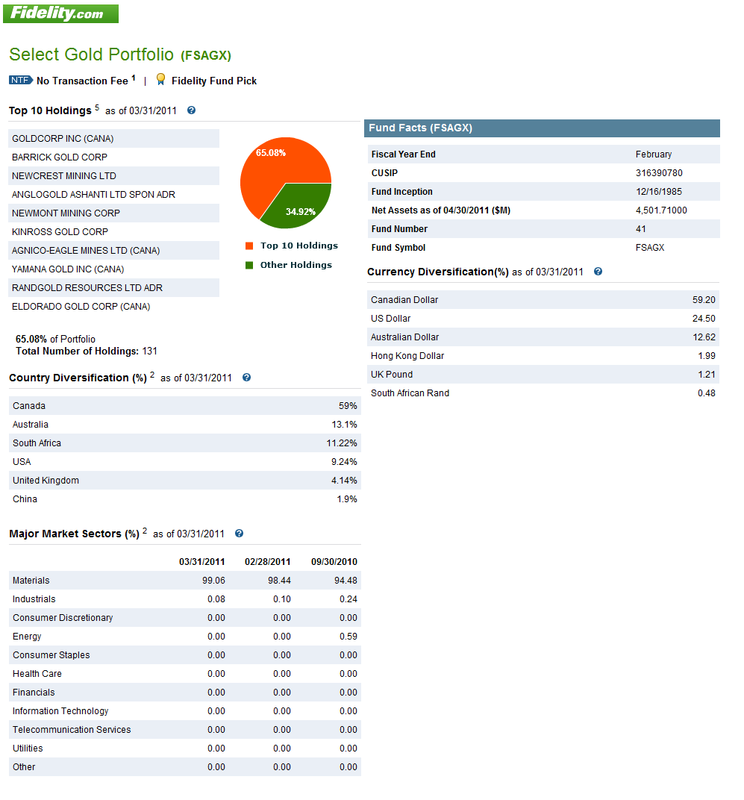 Fidelity Select Gold is one of the funds recommended by Fidelity. Investment in FSAGX is looking for capital appreciation. The majority of the assets are invested in securities of companies mainly engaged in gold-related activities, and in gold bullion or coins. The fund may invest up to a quarter of its assets in gold and other precious metals through a wholly-owned subsidiary. Joe Wickwire has managed this mutual fund since August 2007. To invest in this fund, you will need a minimum balance of $2,500 for brokerage and IRA account. Additional investment can be done with no minimum amount. This fund is a no-sales load fee fund means there is no 12b1 fee and no front-end sales load. FSAGX has 0.89% annual expense ratio rate. After its 25 years in the market, this fund has 3.11% year-to-date return. It has experienced 15 years with up performance and 10 year with down performance. The worst 1-year return was in 1997 with -39.39%. It has returned 27.52% over the past one year and 22.557% over the past decade. This fund can be purchased from only 67 brokerages such as JP Morgan, Vanguard, T Rowe Price, EP Fee Small, CommonWealth PPS, Royal Alliance, Raymond James, MSSB Retail Fund, Schwab Retail, E Trade Financial, etc. 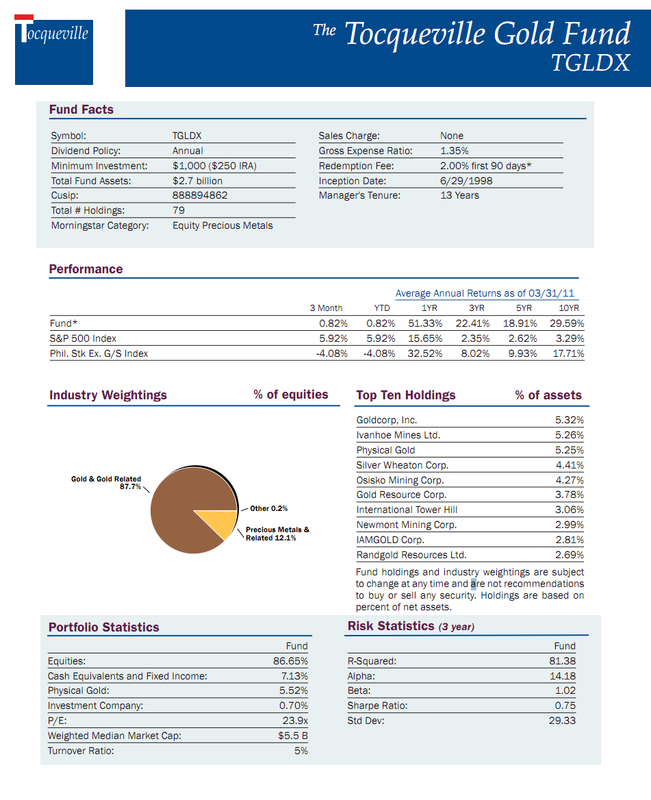 As of March 2011, this fund has 131 holdings with the top ten holdings make up of 65.08%. They are Goldcorp Inc, Barrick Gold Corp, Newcrest Mining Ltd, Anglogold Ashanti Ltd, Newmont Mining Corp, Kinross Gold Corp, Agnico-Eagle Mines Ltd, Yamana Gold Inc, Randgold Resources Ltd and Eldorado Gold Corp. 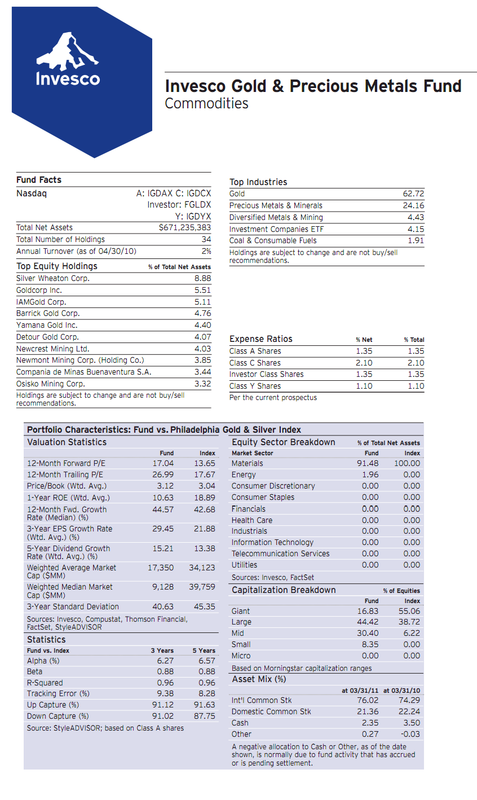 The following is fund performance of the funds listed above.